PUNE: Location has always been the primary factor in driving real estate growth landscape followed by augmented infrastructure development framework. Presently, Infrastructure is among one of the key driver in propelling India’s economic growth story and enjoys intense focus from the government to accelerate new proposed plans. Recent initiatives of the government on new rapid transportation policies ensures time-bound creation of best in class infrastructure in the country. In 2016, India ranked 35th among 160 countries in World Bank’s Logistics Performance Index which signifies infrastructure growth pattern in the form of development of bridges, highways, railways, roads & hi-tech rapid transportation in the country. In Sync with the new trend of ‘creative disruption’ high speed transportation has a new star - ‘Hyperloop’. The MoU inked between Maharashtra State Government and Virgin Hyperloop One seeks to search and identify potential efficient routes to connect the high growth cities and also improving inter-city mobility. 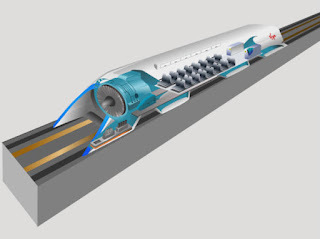 As quoted by State Chief Minister Shri Devendra Fadnavis ‘Hyperloop' route requires high density traffic to become viable as means of rapid public transit. Among the most populous cities in India, Mumbai & Pune have potential to provide an optimal route intensifying the connectivity between the metropolitan regions of both the cities. Hyperloop transportation technology may connect Mumbai-Pune in phenomenal speed time of 20 minutes. This disruptive reinvention of high tech speed transportation will transform two cities into India’s first and largest Megapolis. This solution could revolutionize the transport experience. “Over the past few years, we have seen how infrastructure developments have reduced travel time, and made a positive impact on the economic growth, paving the way for job creation in what were the remote pockets when viewed from the perspective of the developmental stretch. These, in turn, morphed metropolitan region into potential real estate markets-which have potential to grow. The Hyperloop technology is competent to ensure development of the megapolis Mumbai and Pune in a manner that will be future perfect. To reinforce vision of Digital India, innovative technology will continue to play pivotal role in reinventing transport system,” says Dr. Niranjan Hiranandani - CMD - Hiranandani Communities.